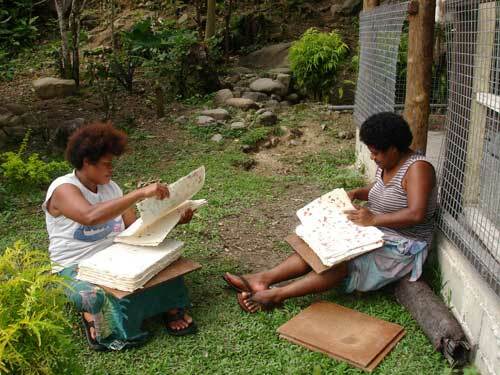 Residents of Wainimakutu village, near Suva, Fiji, make paper by hand in a project sponsored by NZAID, a division of New Zealand's Ministry of Foreign Affairs and Trade. The paper is produced from mulberry and other local plants and is used to package soaps and oils for the tourist industry. The income from these products supports secondary education for village children. In 2011 New Zealand's aid budget was more than $500 million, and over half was spent in Pacific countries such as Fiji.